Some of you may know that there are actually two Australian government agencies who are equipped to, and indeed do, accept UFO reports from flight crews. They are the Australian Transport Safety Bureau (ATSB) and Airservices Australia (ASA). Of the two, ASA describes itself as “. . . a government owned corporation providing safe, secure, efficient and environmentally responsible services to the aviation industry.” Earlier this year I submitted a Freedom of Information (FOI) request for any UFO, or UFO-like, reports submitted to ASA by flight crews, with the date range of 2008 to 2015. I published the results of that effort in January, 2015, and my findings can be looked at here. On the 18th of February, 2015 Sasha Pesic, ASA’s very helpful Freedom of Information & Privacy Contact Officer/Legal Inquiries Coordinator, asked me if I would grant them an extension of time in searching their database(s) and preparing any found material, which, despite not being famous for my patience, I agreed to. On the 7 May, 2015, I received the results of my request. At one page, in PDF form, ASA supplied me with 3 UFO or related events in table form, which is imaged above, top. On the 18th of June, 2012, Keith was furnished with internal ASA material containing a number of media enquiries to ASA, enquiries to ASA from the general public, etc, but not the details of the case I speak of here, despite the fact that it should have been located and released in response to his FOI request. I mean, sure, in my FOI request I was more specific in my search demands, but they must have known what Keith was looking for, and no amount of semantics or trickery can change that fact. Put simply: This UFO case – and it is a UFO case, as we shall see - occurred in 1999. Keith’s FOI was in 2012. By rights, Keith or I should be asking ASA what went on and why. But that is for another time. Anyway, I digress. Our UFO case here at hand occurred at UTC Date/Time: 199906231015, which is Coordinated Universal Time (the old Greenwich Mean Time), and, is simply 1999, 23erd of June, at 10:15am.. As the event occurred while both aircraft were enroute to Alice Springs, if anyone noticed, I would like to say that this incident happened somewhere over central Australia. Now, 199906231015 happens to be 1945hrs in central Australia, or, 7:45pm. At that time the sky is dark, so, one may presume that any object that is be described as “green” was almost definitely luminous. As for the planes involved (AJP and AJK), well, they are both business jets built by Israeli Aircraft Industries, model Westwind, type IAI 1124 according to online Australian aircraft registration records. They carry two crew, and operate at a maximum speed of 865km/hr at 29,000 feet, but cruise at 725km/hr at 39-41,000 feet. 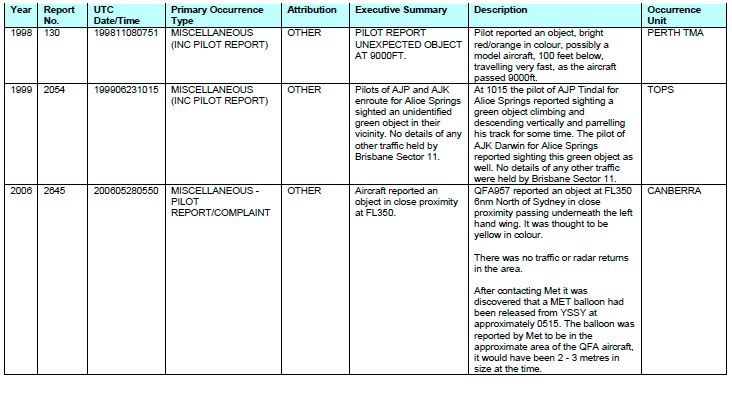 Seeing as the Executive Summary states “Pilots of AJP and AJK enroute for Alice Springs”, there is every chance that the aircraft were travelling at a pretty high velocity. Which means the UFO was too. Whatever the speed, wherever the locale, even the admittedly limited data presented this one page ASA document raises some awkward questions. Firstly, what can dip up and down in the atmosphere, and then decide to track with a jet “for some time”? 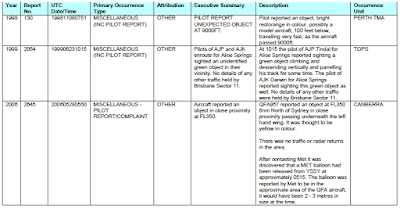 We can’t rule out another aircraft, but it would mean, one would assume, a very bright green light(s) aboard; as well as a desire to joyride along with no flight plan submitted, and no effort to communicate: The ASA material does state “No details of any other traffic were held by Brisbane Sector 11.” If it was likely another aircraft, did ASA or the Australian Transport Safety Bureau (ATSB) investigate? If not, why? Secondly, one could go down the military ordinance path, and assume a fire-and-forget missile was involved. Does the Australian Defence Force actually employ such missile systems near known flight paths, which glow green? Thirdly, probably most importantly, what related material is ASA, or the ATSB, sitting on in regards to this event? We may soon find out. I have submitted an FOI request to both ASA and the ATSB for any associated records that could even remotely be attached to this event. If there are none, I can assure you, I will be asking why. This case is nearly as new to me as it is to you, the reader. For example, I need to find out what airlines were operating the two planes involved. And, when that is achieved, I will be kindly asking them to furnish me with the contact details of the pilots who were witness to the event. It may not be even possible though. I would also like to use this opportunity to ask any pilots, or other persons linked to the aviation industry, to contact me. History tells us there will be a great deal more cases such as this one.